Denis Villeneuve has been on a hot streak of late, taking awards in Cannes for his stunning short Next Floor, returning to the big festival the next year with Polytechnique which would eventually sweep Canada's film awards, and now premiering in Toronto with his latest effort Incendies. Twins Jeanne and Simon Marwan (Mélissa Désormeaux-Poulin, Maxim Gaudette) weren't expecting much from their mother Nawal's will (Lubna Azabal). They are understandably stunned when Jean Lebel (Rémy Girard), notary and long-time friend of Nawal's, reads her last wishes: for the twins to hand-deliver two letters, one to a father they thought dead, the other to a brother they never knew existed. Helped by Jean Lebel, the twins slowly piece together Nawal's heartbreaking story: that of a life mortgaged by the self-fuelling cycle of war and hate... and finally discovering their mother's exceptional courage and resolve. 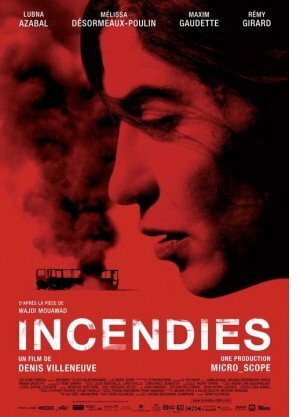 Adapted from Wajdi Mouawad's acclaimed stage play, Incendies takes an unbiased and painfully poetic look at the roots of all wars through two young adults' personal voyage to the core of hatred and enduring love. À la mort de leur mère, les jumeaux Jeanne et Simon Marwan reçoivent de la part du notaire Lebel des indications claires sur les dernières volontés de la défunte : ils doivent retrouver leur père, qu'ils croyaient mort depuis longtemps, et leur frère, dont ils n'avaient jamais entendu parler, pour leur remettre chacun une lettre. Voyant que Simon est réticent, Jeanne décide de se rendre seule au Moyen-Orient afin d'enquêter sur le passé de sa mère et de lever le voile sur le mystère qui entoure l'origine de sa famille. Simon se rendra lui aussi sur les lieux afin d'aider sa soeur dans sa quête.